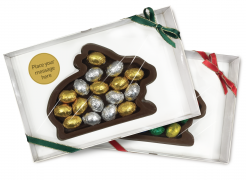 A wide range of chocolate designs that are suitable for presentation in our wide range of foil colours. Minimum order 250 units (5 packs) Forme cut custom printed band as shown. For a straight edge cut sticker please see other cigar listing. Customised small chocolate in choice of foil colour. Create your own chocolate with your logo or design embossed in chocolate.